The Pratt & Whitney R-4360 Wasp Major is an American 28-cylinder four-row radial piston aircraft engine designed and built during World War II, and the largest-displacement aviation piston engine to be mass-produced in the United States. It was the last of the Pratt & Whitney Wasp family, and the culmination of its maker's piston engine technology, but the war was over before it could power airplanes into combat. It did, however, power many of the last generation of large piston-engined aircraft before turbojets, and equivalent (and superior) horsepower turboprops (such as the Allison T56), supplanted it. Its main rival was the Wright R-3350 Duplex-Cyclone. The R-4360 was a 28-cylinder four-row air-cooled radial engine. Each row of seven air-cooled cylinders possessed a slight angular offset from the previous, forming a semi-helical arrangement to facilitate effective airflow cooling of the cylinder rows behind them, inspiring the engine's "corncob" nickname. 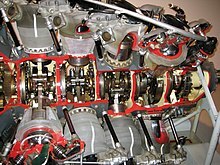 A mechanical supercharger geared at 6.374:1 ratio to engine speed provided forced induction, while the propeller was geared at 0.375:1 so that the tips did not reach inefficient supersonic speeds. The four row configuration had severe thermal issues that decreased reliability, with an intensive maintenance regime involving frequent replacement of cylinders required as a result. Large cooling flaps were required, which decreased aerodynamic efficiency, putting extra demands on engine power when cooling needs were greatest. Owing in large part to the maintenance requirements of the R-4360, all airplanes equipped with it were hugely expensive to operate and suffered decreased availability. Its commercial application in the Boeing Stratocruiser was unprofitable without government subsidy. Abandonment of the Stratocruiser was almost immediate when jet aircraft became available, while aircraft with smaller powerplants such as the Lockheed Constellation and Douglas DC-6 remained in service well into the jet era. Engine displacement was 4,362.5 cu in (71.489 L), hence the model designation. Initial models developed 3,000 hp (2,200 kW), and later models 3,500 hp (2,600 kW). One model that used two large turbochargers in addition to the supercharger delivered 4,300 horsepower (3,200 kW). Engines weighed 3,482–3,870 lb (1,579–1,755 kg), giving a power-to-weight ratio of 1.11 hp/lb (1.82 kW/kg). Wasp Majors were produced between 1944 and 1955; 18,697 were built. 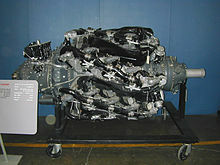 A derivative engine, the Pratt & Whitney R-2180-E Twin Wasp E, was essentially the R-4360 "cut in half". It had two rows of seven cylinders each, and was used on the postwar Saab 90 Scandia airliner. R-4360-51 VDT - "Variable Discharge Turbine" 4,300 hp (3,210 kW). Intended for B-36C. Used on Boeing YB-50C Superfortress. 2-Power recovery turbines. An R-4360 is on display at the Mid America Museum of Aviation and Transportation in Sioux City, Iowa. An R-4360 is on display at the Museum of Flight in Seattle, Washington. An R-4360 is on display at the Heritage Flight Museum in Burlington, Washington. An R-4360 is on display at the New England Air Museum, in Windsor Locks, Connecticut. An R-4360 is on display at the Museum of Alaska Transportation and Industry in Wasilla, Alaska. An R-4360 is on display at the CAF Airpower Museum in Dallas, Texas. An R-4360 is on display at the Air Zoo in Kalamazoo, Michigan. An R-4360-20WA is on display at the Teaneck Ignition Service in Teaneck, New Jersey. An R-4360-20WD is on display at the Combat Air Museum in Topeka, Kansas. An R-4360-59B is on display at the Combat Air Museum in Topeka, Kansas. An R-4360-69 is on display at the Castle Air Museum in Atwater, California. An R-4360 cutaway is on display at the Hill Aerospace Museum at Hill Air Force Base in Roy, Utah. An R-4360 cutaway is on display at the Air Victory Museum in Lumberton, New Jersey. An R-4360 cutaway is on display at the Air Zoo in Kalamazoo, Michigan. An R-4360 cutaway is on display at the Museum of Aviation in Warner Robins, Georgia. An R-4360 cutaway is on display at the Evergreen Aviation and Space Museum in McMinnville, Oregon. An R-4360 cutaway is on display at the CAF Airpower Museum in Dallas, Texas. An R-4360 cutaway is on display at the Pima Air and Space Museum in Tucson, Arizona. An R-4360 cutaway is on display at the Air Force Armament Museum at Eglin Air Force Base in Valparaiso, Florida. An R-4360 cutaway is on display at the Strategic Air Command & Aerospace Museum in Ashland, Nebraska. An R-4360-4 cutaway is on display at the National Museum of Naval Aviation in Pensacola, Florida. An R-4360-59B cutaway is on display at the Steven F. Udvar-Hazy Center of the National Air and Space Museum in Chantilly, Virginia. An R-4360-59B cutaway is on display at the Florida Air Museum in Lakeland, Florida. Bore: 5.75 inches (146 mm). Stroke: 6.00 inches (152 mm). Displacement: 4,362.5 cubic inches (71,489 cm3). Length: 96.5 inches (2,450 mm). Diameter: 55 inches (1,400 mm). Dry weight: 3,870 pounds (1,760 kg). ^ "Ernest K. Gann's Flying Circus: Lady with a past". Ovi.ch. Retrieved 2012-06-18. ^ "About the Museum". Mid America Museum of Aviation and Transportation. Retrieved 18 February 2018. ^ "Goodyear F2G-1 Super Corsair". The Museum of Flight. The Museum of Flight. Retrieved 18 February 2018. ^ a b c d e f g h i j k l m n o p Huff, Randy. "Engines in North American Museums". Aircraft Engine Historical Society. Aircraft Engine Historical Society. Retrieved 18 February 2018. ^ "Pratt & Whitney R-4360 Wasp Major". Heritage Flight Museum. Avada. Retrieved 18 February 2018. ^ a b "ENGINES ON DISPLAY". Combat Air Museum. Combat Air Museum. Retrieved 18 February 2018. ^ ""Wasp Major" Engine". Hill Air Force Base. United States Air Force. 20 January 2007. Retrieved 18 February 2018. ^ "R-4360 Wasp Major". Air Victory Museum. Air Victory Museum. Retrieved 18 February 2018. ^ "Pratt & Whitney Wasp Major R-4360-59B, Cutaway, Radial Engine". Smithsonian National Air and Space Museum. Smithsonian Institution. Retrieved 18 February 2018. ^ "Exhibits". SUN 'n FUN. SUN 'n FUN. Retrieved 18 February 2018. ^ "WELCOME TO THE MID-ATLANTIC AIR MUSEUM". www.maam.org. Retrieved 2018-09-07. ^ "Pratt & Whitney R-4360 "Wasp Major"". National Museum of the US Air Force™. Retrieved 2018-09-07. Bridgman, Leonard, ed. Jane's All The World's Aircraft 1951–1952. London: Samson Low, Marston & Company, Ltd 1951. White, Graham (2006). R-4360: Pratt & Whitney's Major Miracle. North Branch, Minn.: Specialty Press. ISBN 1-58007-097-3. Wikimedia Commons has media related to Pratt & Whitney R-4360.